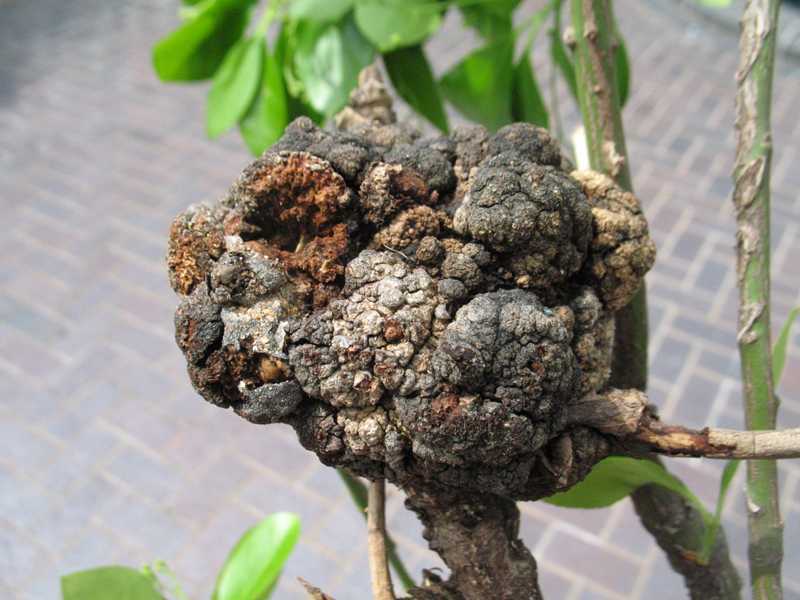 Crown gall is a plant disease caused by the soil-inhabiting bacterium, Agrobacterium tumefaciens. The bacterium causes abnormal growths or galls on roots, twigs, and branches of euonymus and other shrubs primarily in the rose family. The bacterium stimulates the rapid growth of plant cells that results in the galls. 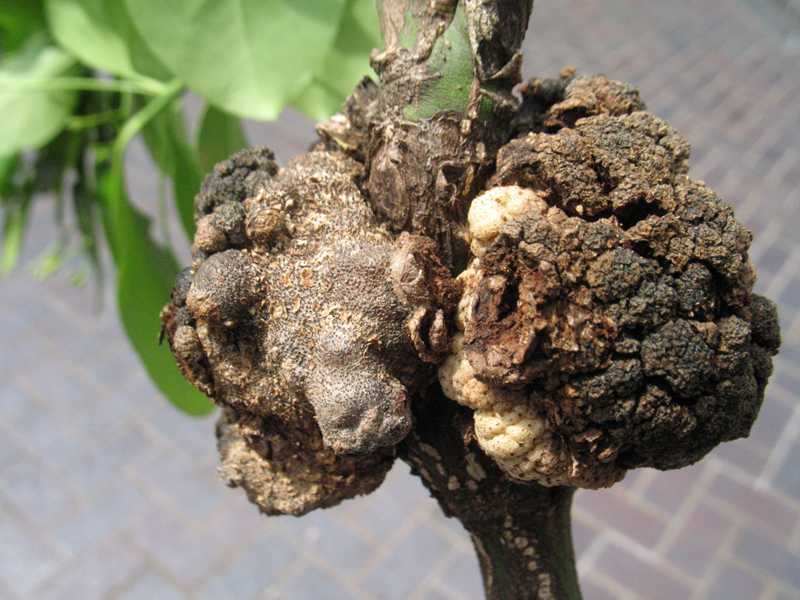 In addition to being unsightly, the galls weaken and stunt the growth of the plant. Although galls can disrupt the flow of water and nutrients up the roots and branches, they usually do not cause total plant death. The disease can spread to other susceptible plants through contaminated soil and tools. Most chemical treatments are not effective. 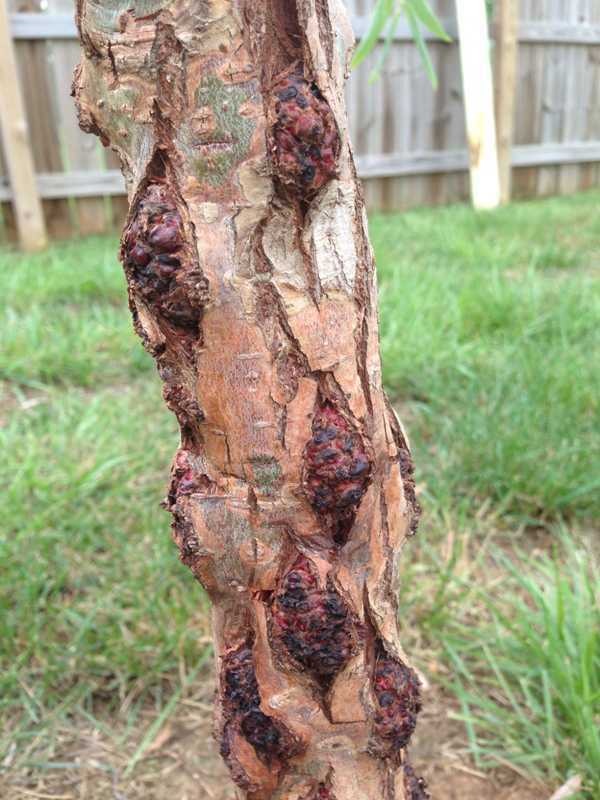 The galls on forsythia, viburnum, highbush blueberry, American elm, hickory, maple, oak, and privet are believed to be caused by a fungus, Phomopsis sp. 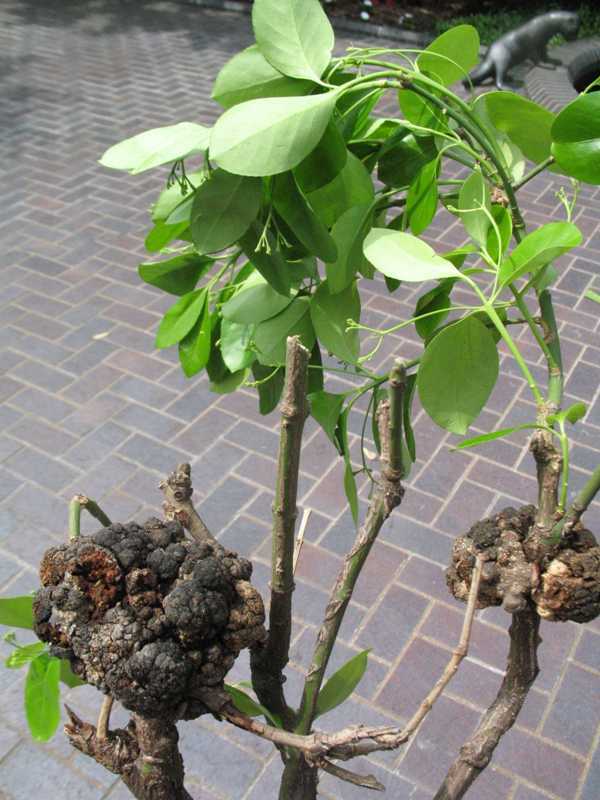 Since its cultural controls are the same as for bacterial crown gall, both are treated together herein. Chemical treatments, however, will differ. Chemical treatments for both are of very limited value to the home gardener. Only those relating to bacterial crown gall have been addressed. 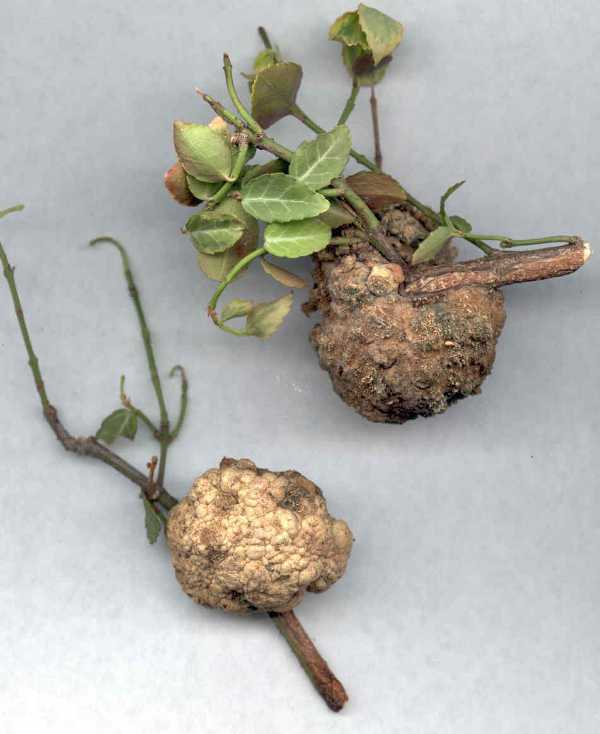 Galls are most commonly found near ground level on the roots and lower branches of the plants. As the galls enlarge, they become woody and hard. The outer layer turns brown and corky. The plant may be weakened and stunted with some branch or tip dieback. Symptoms may not develop immediately after infection. Galls grow most rapidly during the warm months of the year. Crown gall forming bacteria inhabit the soil and survive for many years. The bacterium can initially be brought in on the roots of infected plants. It then spreads by soil and water movement or contaminated pruning tools. Bacteria enter the plant through wounds possibly caused by chewing insects, cultivation damage, or from grafting and pruning tools. 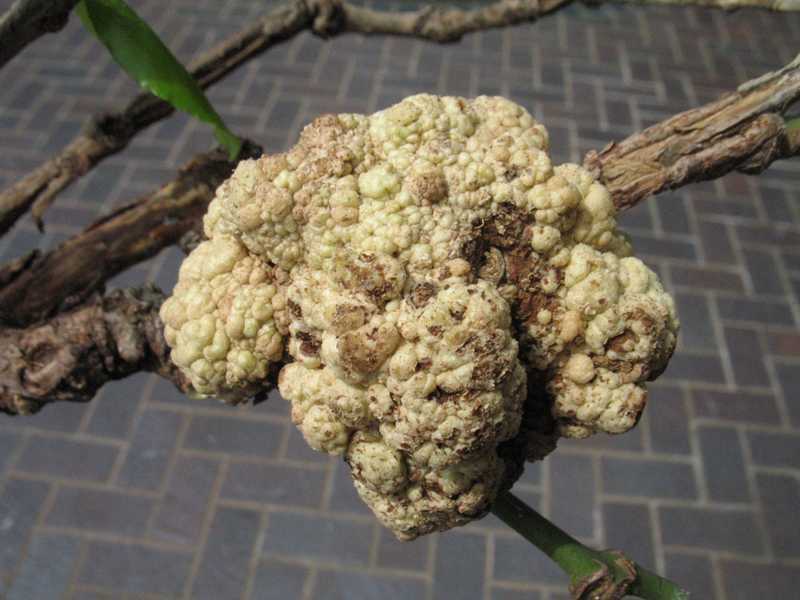 The crown gall bacterium has been known to survive more than two years in the soil in the absence of susceptible plants. It can live for several years in decomposing galls buried in the soil. Crown gall is likely to be more serious in limed soil than in acid soils so soil pH could be important in limiting the disease. 1. Prune out infected material. Crown gall cannot be eliminated from a shrub even though the infected plant may live for many years. 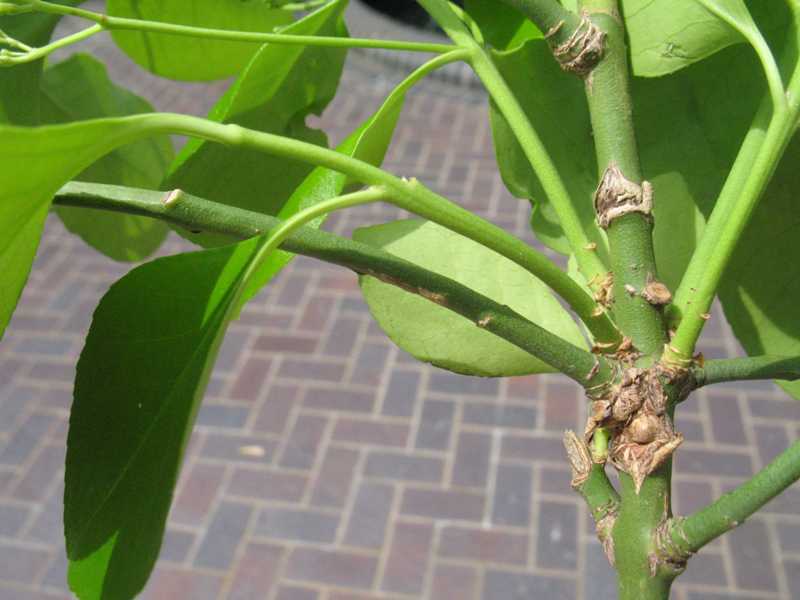 To improve the appearance of the plant, prune out and destroy infected stems below the galled area. Sterilize the pruning shears after each cut with a mixture of one part bleach to nine parts water. 2. Destroy infected plants. Destroy the infected plant. The bacterium will remain in the soil so it is important to plant a resistant plant species. If the same species needs to be planted in the area, remove and replace the soil or consider soil sterilization. 3. Sterilize the soil. Soils known to be infected with crown gall bacteria can be sterilized using chemicals, heat, or antibiotics. This is not practical for most home gardeners. 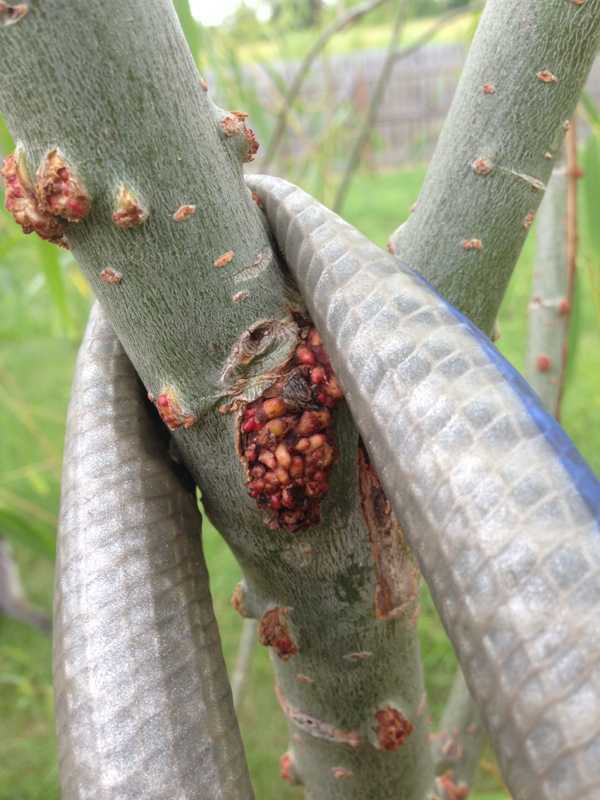 A biological control has been introduced using a bacterium, Agrobacterium radiobactor strain 84. This bacterium was discovered to be antagonistic to crown gall bacterium. It is available for use as a preplant treatment by dipping nursery stock in a suspension of the live bacteria in water. 4. Exclude the problem. 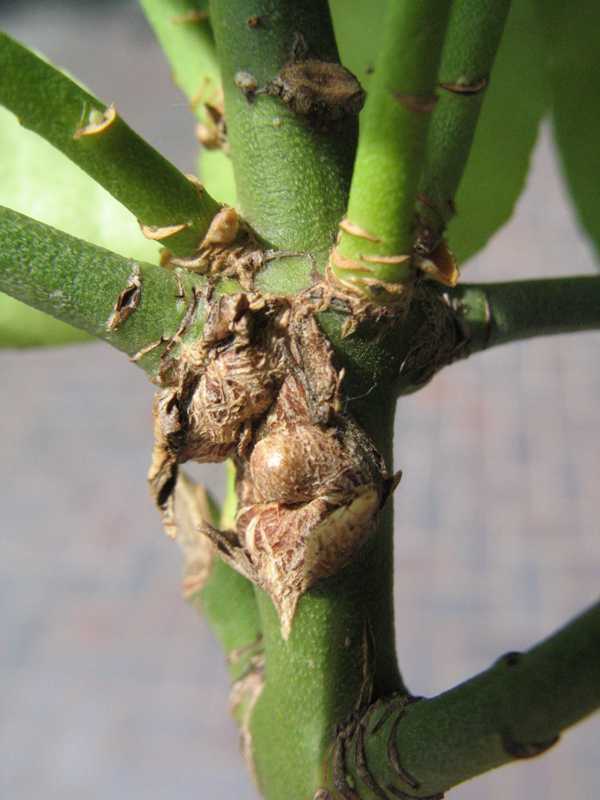 When purchasing forsythia and euonymus plants, inspect them carefully for signs of galls. 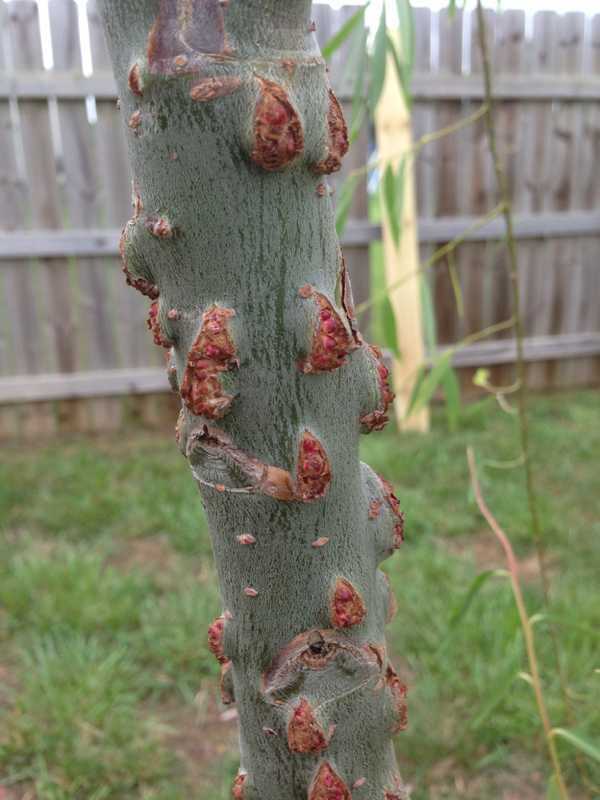 Do not purchase plants that show gall-forming symptoms. 5. Replant with a more resistant plant species. The following plants recommended by the University of Illinois show greater resistance to bacterial crown gall: barberry, hornbeam, true cedars, ginkgo, golden raintree, tulip tree, mahonia, spruce, linden, boxwood, catalpa, beech, holly, larch, magnolia, black gum, pine, Douglas fir, bald cypress, hemlock, birch, firethorn, redbud, smoke tree, sweet gum, deutzia, serviceberry, yellowwood, yew, and zelkova. Strategies 1, 2, 4, and 5 are strictly organic approaches. Young crown gall on Manhattan euonymus. Note pale color. Old crown gall on Manhattan euonymus. Note dark color.